We’d love your help. Let us know what’s wrong with this preview of This Is Your Brain on Music by Daniel J. Levitin. • Are our musical preferences shaped in utero? • Is there a cutoff point for acquiring new tastes in music? • What do PET scans and MRIs reveal about the brain’s response to music? • Is musical pleasure different from other kinds of pleasure? To ask other readers questions about This Is Your Brain on Music, please sign up. Does it explain the nexus between music and appitude in math? A book is the wrong medium for this information. As I read this book, I kept wishing I was watching a PBS show version of it instead, where I could HEAR the music Mr. Levitin was referencing, and see visuals of the brain showing what parts are being affected by music, and how they all link up. Instead of having to tell us in excruciating detail what an octave is, he could demonstrate on an instrument, and we could hear it for ourselves. When discussing half steps and whole steps, we could both h A book is the wrong medium for this information. As I read this book, I kept wishing I was watching a PBS show version of it instead, where I could HEAR the music Mr. Levitin was referencing, and see visuals of the brain showing what parts are being affected by music, and how they all link up. Instead of having to tell us in excruciating detail what an octave is, he could demonstrate on an instrument, and we could hear it for ourselves. When discussing half steps and whole steps, we could both hear them, and see how a piano's white and black keys work with the structure of the scale. Beyond all that, I'm a little disappointed in the focus of the book. Mr. Levitin says at one point that he is more interested in the mind, than in the brain. And yet, instead of telling us how all these brain interactions manifest in our minds, he focuses on details about the cerebellum and the amygdala. We learn what parts of the brain act together when listening to music, but not much what that MEANS to us mentally. I guess I wanted more psychology, less biology. That doesn't make the subject any less fascinating. I think my favorite chapter was the one on what makes a musician. It's not just innate talent. No, it takes hours and hours and hours of practice, 10,000 in fact to master an instrument (this may sound familiar to those of you who read Malcolm Gladwell's book Outliers). It may also take helpful physiology, like long fingers to reach keys on a piano easily. But humans are INNATELY musical, and how our brains and bodies react to music is astonishing. And I liked this quote: "Music communicates to us emotionally through systematic violations of expectations." There's a lot of amazing stuff in this book to contemplate, but the author tries too hard to make it relevant for readers who listen to the Eagles and Mariah Carey (musicians he specifically sites), and he gets caught up in the most mundane details of his personal interactions with his colleagues at meetings and dinners and such, and who ordered what, and how everybody was dressed, and where everybody got their degrees. My girlfriend got me interested in it because I found her passionate explanat There's a lot of amazing stuff in this book to contemplate, but the author tries too hard to make it relevant for readers who listen to the Eagles and Mariah Carey (musicians he specifically sites), and he gets caught up in the most mundane details of his personal interactions with his colleagues at meetings and dinners and such, and who ordered what, and how everybody was dressed, and where everybody got their degrees. Seemingly for musicians or composers this book is more fitting a read for scientists and doctors. Not much content is musicianship related. Middle third is a bore. - People Seemingly for musicians or composers this book is more fitting a read for scientists and doctors. Not much content is musicianship related. Middle third is a bore. I'll stop now. This list is already too long. Recommends it for: Any musician who has the patience to really pay attention to what the author is saying. From the reviews I've seen here, the material seems to have passed over most people's heads (by being too rough, or the phrase you'll come across a few times, "I didn't feel like I walked away exclaiming 'eureka!'"... or the book angered more expert readers by its simplicity, but it wasn't meant to talk of new discoveries as much as it was meant for a general public. The book takes a while for an average person, and I'd say you have to have some knowledge of chorded instruments and such where yo From the reviews I've seen here, the material seems to have passed over most people's heads (by being too rough, or the phrase you'll come across a few times, "I didn't feel like I walked away exclaiming 'eureka!'"... or the book angered more expert readers by its simplicity, but it wasn't meant to talk of new discoveries as much as it was meant for a general public. The book takes a while for an average person, and I'd say you have to have some knowledge of chorded instruments and such where you'd come across ideas such as frequencies ringing together to form major and minor chords. It covers various interesting topics, and I speculate the reason people walk away feeling not so enlightened is because after chapter 8+, chapters 1-5 are a distant memory. If you have trouble, jot down a few things, it helped me. There is one chapter that the author wastes time talking about a dinner with his idol neuro-scientists from which you will take not much away except for a list of forgettable names and how the next chapter's ideas were spurred by one of the professors' advice: "Look at the connections [something along those lines at least]". Overall, Im glad I read this book, and often check back to it as a reference, and it's great food for thought. As a musical ignoramus, I appreciated the Music 101—I think I can finally grasp what a “key” and a “major chord” are. And I was enlightened by his perspectives on how expectation and violation of chord progressions has a lot to do with enjoyment of music. As a former neuroscientist, I appreciated the review of progress in the field. As one would expect, music engages both primitive emotional circuits and higher analytic systems involved in memory, temporal information processing and prediction. The overlap with language systems is interesting, and speculation on cerebellar involvement beyond motor performance was fascinating. That people with Wilson’s syndrome are good at music and empathy while those with Autism Spectrum Disorders are not provides some important food for thought. But the brain stuff I don’t believe helps anyone appreciate why music is so special to our human culture or is so pleasurable. For this, he goes out of his field to summarize arguments against the notion that music is sort of an accident of evolution of cognitive skills with clear adaptive value. He quotes Pinker: “Music is auditory cheesecake…It just happens to tickle several important parts of the brain in a highly pleasurable way, as cheesecake tickles the palate.” In Gould’s architectural analogy, music is like “spandrels”, those elegant spaces between arches which were not invented for their own sake. Levitin assembles evidence for music prevalence in all current and past human cultures, its importance for social cohesion and courtship, and lands on the evolutionary psychology perspective that its adaptive value relates to sexual selection (i.e. musical skills conveyed reproductive advantages through mate selection). For the discussion on heritability of music skills, I felt he was fairly even handed, leaving open that even Mozart’s genius may have benefited mostly from practice and environment in the nature/nuture perspective. Musical skill fits in with the larger ongoing question of genetic contributions to artistic creativity. A nice emphasis in this book is Levitin’s consideration of how even the average person qualifies as an expert and skilled listener and how our current division between performers and listeners represents a violation of the ancient traditions of all members of society participating in both. Someone left this behind in the cubby of the plane seat on a flight I took in December. As I'd finished my magazines, I picked it up, and then couldn't put it down. What was most fascinating about the book was the ease at which concepts I'd struggled with years ago were made crisp, clear, and, well, obvious, as they should have been back then. Introductory concepts of music were never made as clear to me than from this. I don't think I could have found a fuller survey of the subject, tying it to Someone left this behind in the cubby of the plane seat on a flight I took in December. As I'd finished my magazines, I picked it up, and then couldn't put it down. What was most fascinating about the book was the ease at which concepts I'd struggled with years ago were made crisp, clear, and, well, obvious, as they should have been back then. Introductory concepts of music were never made as clear to me than from this. I don't think I could have found a fuller survey of the subject, tying it to subjects I'm interested in (math, cognition) if I'd looked, and there it was, for free. So I was thrilled about this book. And it was indeed pretty good. My main takeaway from it is that our enjoyment of music stems from the setting up and violation of expectations and human's innate instinct to seek out patterns in whatever stimuli that comes our way. I recommend the audiobook version because it provides musical examples of what the author is talking about, so I believe it's much more convenient to comprehend that the written version. It took a while to finish because every time I started listening to the book about music I got a massive urge to listen to some. So I had to scratch that itch, and that kept me distracted from reading Brain on Music in big chunks. In Daniel Levitin's own words, "This book is about the science of music, from the perspective of cognitive neuroscience…. I'll discuss some of the latest studies I and other researchers in our field have conducted on music, musical meaning, and musical pleasure…. [H]ow can we account for wide differences in musical preference -- why is it that one man's Mozart is another man's Madonna?" (p. 11) After reading these 270 pages, I'm sure I can't tell you. I'm pretty disappointed, but then I had real In Daniel Levitin's own words, "This book is about the science of music, from the perspective of cognitive neuroscience…. I'll discuss some of the latest studies I and other researchers in our field have conducted on music, musical meaning, and musical pleasure…. [H]ow can we account for wide differences in musical preference -- why is it that one man's Mozart is another man's Madonna?" (p. 11) After reading these 270 pages, I'm sure I can't tell you. I'm pretty disappointed, but then I had really high expectations for this book which it failed to meet (I should know by now never to read the back-cover hype, let alone the 4 pages of promotional blurbs that preceded the table of contents). But before confessing my own failings here, let me lay a little blame at the author's feet. Right off the bat, he states, "It's a shame that many people are intimidated by the jargon musicians, music theorists, and cognitive scientists throw around. There is specialized vocabulary in every field of inquiry (try to make sense of a full blood-analysis report from your doctor). But in the case of music, music experts and scientists could do a better job of making their work accessible. That is something I tried to accomplish in this book." (p. 10) Levitin also talks about harboring a preference for identifying how the brain interprets moving air molecules as music and the behavioral/emotional significance/origins of this auditory processing over simply mapping where in the brain music triggers neurons. To that, I say, ha, ha, and double-ha. We take you live to a typical passage (p. 191), which begins as follows: "We found exactly what we had hoped. Listening to music caused a cascade of brain regions to become activated in a particular order: first, auditory cortex for initial processing of the components of the sound. Then the frontal regions, such as BA44 and BA47, that we had previously identified as being involved in processing musical structure and expectations. Finally, a network of regions -- the mesolimbic system -- involved in arousal, pleasure, and the transmission of opiods and the production fo dopamine, culminating in activation in the nucleus accumbens. And the cerebellum and basal ganglia were active throughout, presumably supporting the processing of rhythm and meter." If you got that, this book is for you (but not me, alas). Levitin devotes the first 1/5 of this book to defining musical terms (tuning, timbre, scale) he will not really use later. It's interesting, but cognitively irrelevant. There is some fun anecdotal stuff buried in here (did you know that if you chop off the 'attack' of a piano from a recording and just play the body of the pitch, it sounds indistinguishable from a flute? did you know that music appreciation and sociability are closely correlated? ), but the questions posed in the introduction are never answered. Is music a by-product of speech, etc. or a seminal human intuition? Ummm… not sure. How and when are music preferences established? Ummm… mostly from exposure during one's teens, but possibly also from that in the womb, early childhood, and later in life. Why? Don't know. Repetition, perhaps? I give this book 2 stars for the extensive annotated bibliography at the end and (ironically, considering the author's stated subject matter preferences) the trivially-interesting pictographic brain mappings of music function in the appendix. What a bummer. People often ask me about how I can be a musician and into sign language. It occurs for them like there is a dichotomy at play. I've never experienced my work in either area to be at odds with the other. This week I'm reading the coolest book I've read in a while: This is Your Brain on Music by Daniel J. Levitin. He was once a musician and sound engineer, but now is a neuroscientist (another set of odd-bedfellow occupations). A Publishers Weekly review says "This is likely the only book whose jac People often ask me about how I can be a musician and into sign language. It occurs for them like there is a dichotomy at play. I've never experienced my work in either area to be at odds with the other. This week I'm reading the coolest book I've read in a while: This is Your Brain on Music by Daniel J. Levitin. He was once a musician and sound engineer, but now is a neuroscientist (another set of odd-bedfellow occupations). A Publishers Weekly review says "This is likely the only book whose jacket sports blurbs from both Oliver Sacks and Stevie Wonder." In the past few days he has enlightened me to myriad fascinating aspects of my relationship to music, both as a musician and as a human being. "Most astonishing was that the left-hemisphere regions that we found were active in tracking musical structure were the very same ones that are active when deaf people are communicating by sign language. This suggested that what we had identified in the brain wasn't a region hat simply processed whether a chord sequence was sensible, or whether a spoken sentence was sensible. We were now looking at a region that responded to sight--to the visual organization of words conveyed through American Sign Language. We found evidence for the existence of a brain region that processes structure in general, when that structure is conveyed over time. Although the inputs to this region must have come from different neural populationşand the outputs of it had to go through distinctive networks, there it was--a region that kept popping up in any task that involved organizing information over time." We tend to make music for as much granted as we do breathing. Music is EVERYWHERE. The same way that you encounter hundreds of advertisements in a day: you also encounter music in various forms.This is Your Brain on Music (yes, based on the popular egg-drug PSA, explores how music is processed within your brain and why we react the way we do. This journey within the musical brain begins with a brief description of music in terms of notes, patterns, tempo, etc. One can skip this section if alread We tend to make music for as much granted as we do breathing. Music is EVERYWHERE. The same way that you encounter hundreds of advertisements in a day: you also encounter music in various forms.This is Your Brain on Music (yes, based on the popular egg-drug PSA, explores how music is processed within your brain and why we react the way we do. This journey within the musical brain begins with a brief description of music in terms of notes, patterns, tempo, etc. One can skip this section if already familiar or simply not interested. It won't hinder your understanding of the subsequent chapters. Levitin then dives into explaining such noteworthy topics as why we get songs stuck in our heads, why certain songs are equated with memories throughout our lives, and how our brain tends to know the next couple notes in a song even if we've never heard it before. All of these topics are augmented with thorough research and scientific explanations; yet, in a lamen's terms. Have you ever wondered how you can listen to an orchestra and pick out the melody, or pick out the violins from the whole ensemble, or pick out the first violin from the violin section, or separate the orchestra from the car alarm outside? If you ever wondered about music and why it is so appealing to us, you'll find this book interesting. Beginning with the basics of how musicians and scientists define music, it moves on to discuss how our brain and mind have evolved to understand music, the im Have you ever wondered how you can listen to an orchestra and pick out the melody, or pick out the violins from the whole ensemble, or pick out the first violin from the violin section, or separate the orchestra from the car alarm outside? If you ever wondered about music and why it is so appealing to us, you'll find this book interesting. I'm not sure if I'm happy with having read this book, i.e. if the read was time well spent or not. The book is far too long for its content, and a bit hit-and-miss. I couldn't really relate to many of the bands that Levitin was referring to (Sting, Eagles), except for some fun facts about the Beatles. Also, some of his personal anecdotes are really boring and didn't help explaining the topic he was discussing. There's an annoying mind/brain dualism in this book. Despite discussing Wittgenstein in I'm not sure if I'm happy with having read this book, i.e. if the read was time well spent or not. The book is far too long for its content, and a bit hit-and-miss. I couldn't really relate to many of the bands that Levitin was referring to (Sting, Eagles), except for some fun facts about the Beatles. Also, some of his personal anecdotes are really boring and didn't help explaining the topic he was discussing. There's an annoying mind/brain dualism in this book. Despite discussing Wittgenstein in a part of the book, Levitin should study him more carefully next time and try to understand the point he was trying to make with his later philosophy. Levitin writes about pitch that it "is the end product of a chain of mental events that gives rise to an entirely subjective, internal mental representation or quality". I would say that this is wrong. First of all, pitch is partly the product of the frequency of the sound itself (the physical, out-there-in-the-world property). Second, pitch is not entirely subjective, since pitch is in a great extent part of a cultural heritage. He writes himself that "[f]or reasons that are largely cultural, we tend to associate major scales with happy or triumphant emotions, and minor scales with sad or defeated emotions." The pitches in a specific scale is largely a cultural product, but also depends on the intrinsic harmonious properties of the certain sounds themselves, such as overtones (how and how much is still a subject to debate). So the subjective, "mental" part of pitch is caught up in this inter-subjective reality, so to speak, even though there are idiosyncratic variations of pitch cognition between listeners. Another example of Levitin's dualism is this: "Our brains can estimate the size of an enclosed space on the basis of the reverberation and echo present in the signal that hits our ears. Even though few of us understand the equations necessary to describe how one room differs from another, all of us can tell whether we're standing in a small, tiled bathroom, a medium-sized concert hall, or a large church with high ceilings." Of course, the computational process in the brain is a part of what makes it possible for us to experience different reverberation, but it is misleading to say that "we" don't learn about reverberational properties but our "brains" do. Certainly, after being exposed to different reverberation all your life, you learn how to distinguish between them; you know how your voice sounds when you're talking inside a church. When you experience a certain reverberation and understand it, then the reverberation that you are conscious of and the computational functions in your brain that make this experience possible, are not two different things but two sides of the same coin. Levitin's attempt to explain why music moves us is slightly interesting, but, again, he confuses us with his dualism. "As the music unfolds, the brain constantly updates its estimates of when new beats will occur, and takes satisfaction in matching a mental beat with a real-in-the-world one, and takes delight when a skillful musician violates that expectation in an interesting way". What on earth do we make of this? Because our brains like it? This just creates another question; why do our "brains" like music - why does the cerebellum find "pleasure in adjusting itself to stay synchronized"? There's no "find pleasure" without a subject, but who is Levitin's subject? The brain? I would say this: Brains do not find pleasure in doing things, PEOPLE find pleasure in doing things! People like to have expectations about the music, people like to match rhythms and follow melodies. The brain is what makes our experience possible. It is not an aswer to the question "why do we like music?" to say "because the brain likes music! ", because it just creates another question: "But why does the brain like music? Who is in the brain liking this music if not the person in which the brain is situated?" Levitin is not alone in presenting this flawed explanation; we see it everywhere in contemprary neuroscience. It doesn't get better when Levitin tries to tackle complexity in music. To an adult, he says, there is music that is too simple to be challenging enough, so s/he will not like it so much. As the music gets more complex, s/he will like it more and more, but then there's a peak, a personal preference about how much complexity can be tolerated, and after that peak, the pleasure s/he gets from the music is falling again until the music is so complex that s/he will simply hate it. This is an inverted-U graph, Levitin tells us, is "intended to acount for [the] variable" why we might "like or dislike a piece of music ... because of its simplicity or complexity". I just want to say that the graph is simply wrong. Think about a beautiful fugue by Bach. Most people would like it a lot, and yet it is very complex. The reason is that people can like it DESPITE its complexity; i.e. you don't NEED to understand the complexity in order to like the piece. Still, it is also possible to penetrate the complexity and try to get a deeper understanding of the piece. There's pleasure on the surface as well as pleasure beneath it! The final chapter about music and evolution is the most interesting one. I'm not sure I agree with Levitin when he says that a lot of birdsong is recursive; I would say that that statement is certainly a question that is still up for discussion. However, Levitin does pretty well in disproving Pinker's thesis that music has no adaptory function, and I would say that for those not interested in penetrating the whole book, the last chapter will probably do just fine on its own. My boyfriend will be very glad that I'm done with this book, since I kept on complaining all the way through as I read it. It definitely does have some interesting facts and ideas within it, so it's vaguely interesting, but more importantly, it's also profoundly irritating. At least for me. Partly due to some logical or factual errors or selective readings of data, and partly (or maybe mostly, come to think of it) due to something in the demeanour that comes across from the author. He's really bl My boyfriend will be very glad that I'm done with this book, since I kept on complaining all the way through as I read it. It definitely does have some interesting facts and ideas within it, so it's vaguely interesting, but more importantly, it's also profoundly irritating. At least for me. Partly due to some logical or factual errors or selective readings of data, and partly (or maybe mostly, come to think of it) due to something in the demeanour that comes across from the author. He's really bloody irritating, and I would have been more taken with the book if he'd just held off the name-dropping a little more. Really. Francis Crick was freaking awesome, and potentially one of the smartest/most insightful scientists ever, but I don't really need to hear all about the 30 minute meeting you had with him once where you talked about your research on a field where he wasn't a particular expert. Especially not about what his hands looked like as he played with his dessert. Actually, in other circumstances I really would like to hear about it, and I am really very jealous of people that did get to meet and talk with Crick, but the fact that one does talk with a genius does not endow your scientific endeavours with any greater meaning or truth. To borrow Levitin's tendency (which I did like) of illustrating with rock analogies, having talked with Jimi Hendrix about chord progressions does not make your bands' songs any more interesting or good, so shut up about that time you guys did heroin together, would you? I was going to keep reading this book until the new year, but I've decided to stop. I would think the combined topics of music and science would interest me, but it didn't, at least not in the way this author tackled it. Being a musician and a music scholar myself, I disagree with some of his statements, many of which don't seem to be scientific and are based in opinion rather than fact. He asserts that most people can tell when two different instruments are being played simultaneously, but I kn I was going to keep reading this book until the new year, but I've decided to stop. I would think the combined topics of music and science would interest me, but it didn't, at least not in the way this author tackled it. Being a musician and a music scholar myself, I disagree with some of his statements, many of which don't seem to be scientific and are based in opinion rather than fact. He asserts that most people can tell when two different instruments are being played simultaneously, but I know that sometimes two instruments played together can sound like one (like when a flute and oboe are played at the same time, it sounds like a unidentified wind instrument, and to the untrained ear, which is the intended audience for this book, the individual timbres may be undetectable). This is only one of the false, broad generalizations he constantly makes. He also insists that music theory and notation are needlessly complicated and intentionally designed so to confuse laymen, which I think is preposterous. Anyone can learn to read music. Yo no soy ningún experto en música. Tampoco soy un verdadero fanático, de esos que viajan kilómetros para asistir al concierto de su banda favorita. Lo que sí soy, como bien lo menciona el libro, es un experto en identificar lo que me gusta: la música me gusta. Y si tú como yo cree que una canción no consiste en más que unas notas aquí, otros acordes por allá, y unas pocas palabras puestas en determinado lugar, bueno, te haría bien leer este libro. El libro está divido en dos partes: la primera d Yo no soy ningún experto en música. Tampoco soy un verdadero fanático, de esos que viajan kilómetros para asistir al concierto de su banda favorita. Lo que sí soy, como bien lo menciona el libro, es un experto en identificar lo que me gusta: la música me gusta. Y si tú como yo cree que una canción no consiste en más que unas notas aquí, otros acordes por allá, y unas pocas palabras puestas en determinado lugar, bueno, te haría bien leer este libro. El libro está divido en dos partes: la primera de ellas en lecciones básicas (pero realizadas magistralmente) de conceptos musicales y de aquello que conforma la música: la segunda parte en cómo el cerebro reacciona a este estimulo de sonido, tanto cuando se hace como cuando sólo se escucha. Ambas partes son igualmente interesantes. A mi parecer la primicia del libro es el concepto de EXPECTATIVA. Explica casi de inicio a final (aunque no exclusivamente) cómo el cerebro se las arregla para crear este concepto y cómo los músicos se aprovechan de ello para sus fines artísticos. Really cool book on the the brain's relationship with and to music. Although written for a general audience, Levitan doesn't significantly dumb down or shy away from the neuroscience at the very heart of the book. At the same time, Levitan let's a very wry, witty sense of humor season his writing. Finally, he's got both the musical and scientific chops to understand the subject matter from both sides. This means there's enough science and detail to impart some pretty technical information, but i Really cool book on the the brain's relationship with and to music. Although written for a general audience, Levitan doesn't significantly dumb down or shy away from the neuroscience at the very heart of the book. At the same time, Levitan let's a very wry, witty sense of humor season his writing. Finally, he's got both the musical and scientific chops to understand the subject matter from both sides. This means there's enough science and detail to impart some pretty technical information, but its presented in a way that you don't have to be a brain surgeon to understand. What is particularly nice is that he also addresses the emotional quality of music, not just the mathematical/structural, in its relation to the brain. Fascinating stuff. •	Our memory system stores information about the relationship between objects and ideas but not necessarily details about the objects themselves. If you want to remember something try to create many associated tags and links to that object. The greater the number of meaningful links and tags the more you will remember about that object through the linking system. I read this after reading Oliver Sacks book "Musicophilia" and it is a great follow up. Did you know that what goes in the ear exists in the brain ... I mean really exists. If you hear a frequency of 440hz, an 'A' on the piano keyboard, there exists an electrical signal in your brain with a frequency of exactly 440Hz. Did you know that every natural tone rings a series of mathematically related tones called the overtone series. The relative volume of these overtones creates timbre. Timbre is wha I read this after reading Oliver Sacks book "Musicophilia" and it is a great follow up. Did you know that what goes in the ear exists in the brain ... I mean really exists. If you hear a frequency of 440hz, an 'A' on the piano keyboard, there exists an electrical signal in your brain with a frequency of exactly 440Hz. Did you know that every natural tone rings a series of mathematically related tones called the overtone series. The relative volume of these overtones creates timbre. Timbre is what makes a trumpet sound like a trumpet and a piano sound like a piano even though they are both playing a 'A' 440. OK that's not such a stretch, but did you know that if we were to electronically remove one of the overtones, the first overtone is the octave or doubling so 880hz, you brain replaces the missing frequency. Think about that, what comes in the ear is unnaturally missing a frequency, but your brain replaces it ... through brain scans we see the 880hz added back in neurologically in the brain. You might say, wow humans are amazing creatures, but this is not solely a human capability. The same experiment was performed on a rabbit and the rabbit's brain also recognizes the discrepancy and compensates for it. OK now here's the really cool part. The experimenters to the signal being read back from brain scans and passed it through an audio amplified and finally to a speaker and the rabbits brain played back the missing frequency. Loved it! The book was highly enjoyable for me and I'm not a professional musician (or a neuroscientist), but I've always been aware of what music can do to me, from meditation to headbanging and beyond. I've read some people got disappointed of finding 'too much music theory' or 'too much neuroscience'; well honestly I don't think the book has to much of either of them, it's not written for neuroscientists or for professional musicians (even when I think both groups could enjoy it), and lets fa Loved it! The book was highly enjoyable for me and I'm not a professional musician (or a neuroscientist), but I've always been aware of what music can do to me, from meditation to headbanging and beyond. 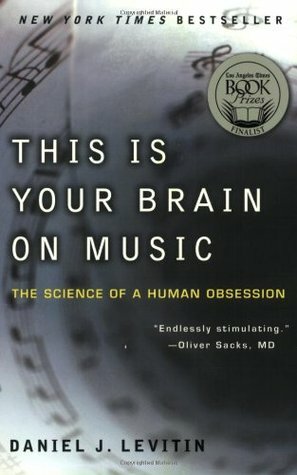 I've read some people got disappointed of finding 'too much music theory' or 'too much neuroscience'; well honestly I don't think the book has to much of either of them, it's not written for neuroscientists or for professional musicians (even when I think both groups could enjoy it), and lets face it, you picked up a book about music and brains, what did you expect? Maybe some people wanted a book with 'fun facts' but guys, if you are willing to understand the surface of this things you MUST know the basics of both subjects, and that's precisely what Daniel Levitin presents here. Otherwise I invite you to pick up a copy of Reader's Digest and indulge yourself with some factoids. Recommends it for: people love science and music. Levitin goes too far out of his way to make the book appeal to the layman. His tone isn't condescending, but he came across as an academic out of his element. Much of the research he cites is very fascinating. When it's all said and done though, I didn't walk away feeling like I had a much better grasp of what my brain is actually like on music. Levitin spends most of the book citing other research and did not assert his own opinions until the very end. I found his own views fascinating, but eve Levitin goes too far out of his way to make the book appeal to the layman. His tone isn't condescending, but he came across as an academic out of his element. Much of the research he cites is very fascinating. When it's all said and done though, I didn't walk away feeling like I had a much better grasp of what my brain is actually like on music. Levitin spends most of the book citing other research and did not assert his own opinions until the very end. I found his own views fascinating, but even then he couldn't tie it all together into something meaningful. So far it's off to a sort of dry start. I'm led to believe that it will get better when he starts getting into the subject matter a bit more, but the first chapter is basically a quick and dirty introduction to music theory, most of which I am already quite familiar with. I'll force myself to get into the second chapter and see how it goes from there. After finishing, I can say this book has a lot of information in it. Levitin explores the Cerebellum's role in processing music, which was fascinat So far it's off to a sort of dry start. I'm led to believe that it will get better when he starts getting into the subject matter a bit more, but the first chapter is basically a quick and dirty introduction to music theory, most of which I am already quite familiar with. I'll force myself to get into the second chapter and see how it goes from there. I really enjoyed it. A lot of the reviews seem to be complaining about the writing style and the author's tone, but honestly I don't remember much about either of those (it's been months since I read this book; I just happened to be thinking about it again today). What I remember most clearly was the ideas, and how it got me thinking about both music and the brain in new ways. I have a keen (if amateur) interest in brains, so approaching it from a familiar direction (music) was a good intro to t I really enjoyed it. A lot of the reviews seem to be complaining about the writing style and the author's tone, but honestly I don't remember much about either of those (it's been months since I read this book; I just happened to be thinking about it again today). What I remember most clearly was the ideas, and how it got me thinking about both music and the brain in new ways. I have a keen (if amateur) interest in brains, so approaching it from a familiar direction (music) was a good intro to the neurology. -When basic elements of sound combine in a meaningful way,it gives rise to music. -Most theories believe music has an evolutionary basis.In order to sing and dance well, you must be mentally and physically fit.It is so deep-rooted in us that it may have helped our pre-human ancestors learn to speak. -Processing music involves almost every region of the brain that we know of. -Appreciation of music is linked to the brain's ability to predict what will come next, and a good composer controls these mu -When basic elements of sound combine in a meaningful way,it gives rise to music. -Appreciation of music is linked to the brain's ability to predict what will come next, and a good composer controls these musical expectations. -Songs can act as keys to memories, because people use the same brain regions for remembering as they do for perceiving music. -Musical expertise comes first from a combination of practice genetic predispositions. -Music preference begins with the music we're exposed to.We choose music we're familiar with.In one study, pregnant women were assigned a specific song to listen to on a regular basis. A year after the babies were born, the researchers played the babies both the assigned song and another song, to see if they showed any preference. Sure enough, they wanted to keep listening to the song they had heard in the womb. This was interesting, but not always the most enjoyable. If you have any basic understanding of neuroscience (I'm talking VERY basic understanding of neurons, the structure of the brain, etc.) and music (I'm talking third grade piano lessons), a lot of this books is tedious. Levitin clearly wants this book to be accessible to anyone, and while that's GREAT, it also means that a lot of groundwork needs to be laid down. Because of this, a lot of time is dedicated to defining things, which is... bo This was interesting, but not always the most enjoyable. If you have any basic understanding of neuroscience (I'm talking VERY basic understanding of neurons, the structure of the brain, etc.) and music (I'm talking third grade piano lessons), a lot of this books is tedious. Levitin clearly wants this book to be accessible to anyone, and while that's GREAT, it also means that a lot of groundwork needs to be laid down. Because of this, a lot of time is dedicated to defining things, which is... boring. Two friends called this book the perfect companion to David Byrne's "How Music Works," and I heartily agree. Where Byrne covers issues of cultural cues and personal responses to music in a broad sense, Levitin dives deep into the neural processing that goes on in music interpretation, and the emotional cerebellar responses that come along for the ride. As a former recording engineer that went back to school to become a cognitive neuroscientist, Levitin gives us just the right balance of persona Two friends called this book the perfect companion to David Byrne's "How Music Works," and I heartily agree. Where Byrne covers issues of cultural cues and personal responses to music in a broad sense, Levitin dives deep into the neural processing that goes on in music interpretation, and the emotional cerebellar responses that come along for the ride. As a former recording engineer that went back to school to become a cognitive neuroscientist, Levitin gives us just the right balance of personal experience and biological detail. You won't find any of the heavy math of Stephen Grossberg's "Neural Networks and Natural Intelligence" or Pentti Kanerva's "Sparse Distributed Memory," but you will find a commoner's explanation, fairly accurate, of how neural networks store artistic memories and attach emotional responses to those memories. We also get a lot of wonderful anecdotes of how Arnold Schonberg set free the boundaries in classical music, how Steely Dan re-invented pop composition, how Joni Mitchell confused and liberated bass players by refusing to use conventional chord systems. We even get Levitin's fascinating story of how he met James Watson and Francis Crick at separate times, under wildly different circumstances. At times, Levitin drifts a little bit into celebrity name-dropping, but with so many unique stories to tell, he can be forgiven a little star-bragging. Those not familiar with theories of how music and language are processed in the human brain may find the entire book an astonishing revelation from beginning to end. Even in the early chapters, I was taken aback by findings such as how a deaf person processes ASL in a manner more similar to a hearing person processing music, than to the processing of language. The chapter on music talent and the development of expertise, in particular, has something for everyone. The final two chapters should bedazzle all readers, no matter how familiar they are with the topic. In his analysis of why we like the music we do, Levitin first takes us to rhythms heard in the womb or in the very early weeks of newborn life, and carries us through the high point of music association with emotions during adolescence. He also has a dual-edged explanation for why people sometimes run away from music they are unfamilar with, sometimes viscerally groaning "That's not music!" In the first instance, new forms of music must be placed within a schema or framework, and the brain's ability to adopt new schemas hits its high point about the time empathic genes and mirror neurons are developed, at about 20 years old. Some people can keep this flexibility through their lives, but many begin losing neural plasticity in their mid-20s. In the second instance, people need schemas as a sense of safety and security. If they are not adventurous, they may respond to "weird" music with a sense of fear and disgust. This should not surprise us, Levitin says. In the same sense that we cannot remove fight/flight mechanisms from our nature, we cannot totally remove our innate desire for safety, familiarity, and security, though we can choose to consciously override that tendency to a certain extent.